Go to Sleep! 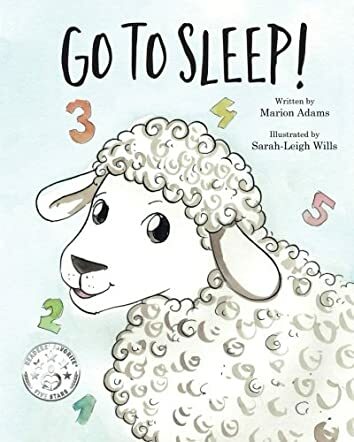 by Marion Adams is a fun children's book about a young sheep named Tansy. Tansy is having trouble sleeping. It is the middle of the night, and yet she is wide awake. Tansy wakes up her mother and asks her what she should do. Her mother suggests thinking of happy thoughts, and then goes back to sleep. Tansy, however, is still awake, and so she wakes up her sister, Teasel, asking what she should do to fall asleep. Her sister suggests that she takes big, deep breaths, and her sister soon goes back to sleep. That doesn't work for Tansy, either. An owl flies by and suggests she counts sheep. Tansy takes her suggestion, but counts one less than there is supposed to be. Where is the missing sheep? I really enjoyed reading Go to Sleep! by Marion Adams. The book is well written and descriptive. This would be great to be read aloud as a bedtime story, because it teaches many strategies about how to fall asleep. The book is full of exciting parts and funny parts. The characters are very likeable and very relatable, because many people have had trouble sleeping, just like Tansy. The pictures by Sarah-Leigh Wills are well drawn, colorful, and clearly depict each scene. The pictures of Tansy are adorable. Children will enjoy reading this book and will want to read it again and again. I would definitely recommend this book to all young readers.